1. Quorum 2. Dancing And Blood 3. Fly 4. Tempest 5. Always Up 6. Always Trying To Work It Out 7. The Son, The Sun 8. Dancing And Fire 9. Poor Sucker 10. Rome (Always In The Dark) 11. Disarray 2018 marks Low's 25th Anniversary. 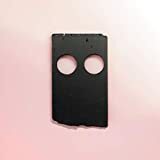 'Double Negative' begins in pure bedlam, with a beat built from a loop of ruptured noise waging war against the paired voices of Sparhawk and Parker the moment they begin to sing during the massive 'Quorum'. For forty minutes they indulge the battle, trying to be heard amid the noisy grain, sometimes winning and sometimes being tossed toward oblivion.